Final Fantasy 15 coming soon i’m really excited for this! what’s your opinion on the game. 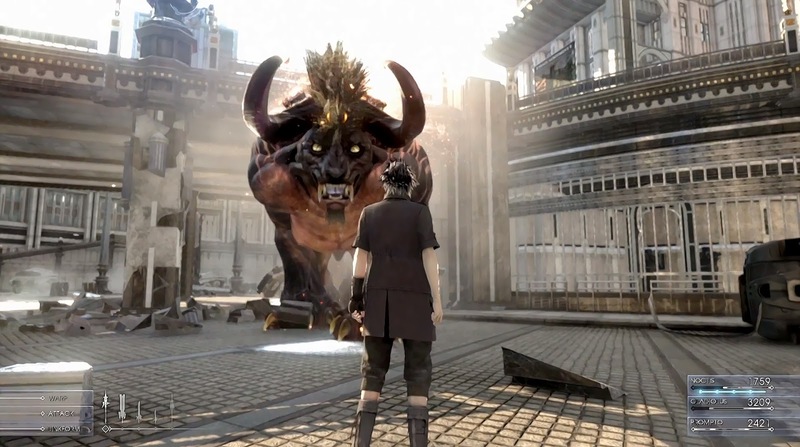 Final Fantasy XV development is coming along nicely, according to Square Enix. “We can’t give too much information but certainly looking at Final fantasy XV, it’s not as if it’s in competition with Kingdom Hearts III for resources or anything like that,” he explained. This falls in line with what we’ve heard in the past; that Kingdom Hearts III will be released a fair while after Final Fantasy XV as the project lead on both, Tetsuya Nomura, can only focus on one game at a time. Here’s some battle gameplay of this highly anticipated RPG. Let me know what you think of the game! I sure can’t wait. Destiny are you ready for it because I am, let me know what you think! Allowing players to build highly customized avatars to their personal liking is becoming a staple of many big franchises; massively multiplayer online role-playing games have already been doing it for years, and doing it well. But Bungie is taking character creation to a whole new level for its next game, offering an ambitious number of skins, armor, weapons and other items for players to work with.Bungies technical art lead Scott Shepherd discussed the work going into Destiny‘s extensive character creation system. Characters’ bodies are broken into four “slots”: the head, chest, arms and legs. Throughout Destiny, players will be able to collect new pieces that can be equipped into these slots. Shepherd said the development team is working to create a balance of power and aestheticism with these pieces, making them both functional and vital to gameplay progression but also visually appealing to players. Shepherd detailed the basic design aesthetics Bungie is using for Destiny‘s three classes, the Hunter, Warlock and Titan. The Hunter class is meant to look like they scavenge the wilderness for gear, with capes torn to scraps and gear based off hazmat suits and gas masks. The Warlock class, the “warrior-scholars,” wear cloaks and robes with hardware tucked underneath. Inspiration for their outfits was drawn from a wide range of sources, from wizards to World War I soldiers. The Titan class is the most heavily armored of the three classes, with gear inspired by medieval armor layered over tight-fitting suits. Please comment would love to know what you think of the game. Electronic Arts, the publisher of the upcoming “Dragon age inqusition” and the tentatively-titled “Mass effect 4,” has been nominated for the worst company in America. According to a report from Kotaku on March 19, the corporation has been put into a tournament bracket with 31 other companies on The Consumerist website. Users will be to vote through all of the rounds to determine the winner of the award.The third main installment from the “Dragon Age” series is expected to fix several issues from the second game.“Dragon Age Inquisition” is launching later this fall while “Mass Effect 4” does not have an official release date. Are you excited because I know I am! Halo (Xbox One) is an upcoming Halo game, introduced during Microsoft’s E3 2013 presentation as the second chapter in the John-117 storyline of the Reclaimer Saga, and the sequel to Halo 4. Few details have been released regarding the game or its plot.Halo (Xbox One) was confirmed to be in development for the Xbox One during the Xbox One Reveal event on May 21, 2013.According to franchise director Frank O’Connor, 343 Industries “will do better next time,”stating that the studio had learned from the experience of creating Halo 4. He also said that he and the rest of 343 Industries look forward to meeting expectations with Halo (Xbox One) as a “next-generation” title. This is the teaser trailer that was revealed at 2013’s E3 conference enjoy. Star Wars: Battlefront is an upcoming Video game in the Star wars battlefront series, under development by DICE. The game was introduced at Electronic Arts’ E3 press conference on June 10, 2013.While no release date has been announced, at EA’s annual meeting of stockholders chief financial officer Blake Jorgensen indicated that the game would be released in the Q2/Q3 of 2015, which correlates to when Star wars episode VII is expected to be released. I don’t Think that I’ll ever get tired of star wars games, especially battlefront. Plants vs. Zombies: Garden Warfare is a multiplayer thrid-person shooter and tower defense video game, it is part of the Plants vs Zombies series, developed by PopCap games and published by Electronic arts. The game was first announced for the Xbox 360 and Xbox one, but later it was reported that it will also be available for Microsoft Windows and “other platforms”.The game features co-op along with competitive multiplayer modes where players can control the zombies as well as plants, and the game was launched on February 25, 2014 in North America, and on February 27 in Europe. Check out some gameplay of multiplayer and survival mode hope you enjoy. In this Game you’re able to play as plants and the zombies both with unique classes to play. Another Zombie Survival Horror Game, But This Time With Parkour! Just rediscovered how cool (Final Fantasy XI) is with the super cool trust system. The journey to become the woman I should be.